What if Fleming hadn’t exited U.N.C.L.E.? We’re coming up on the 50th anniversary of Ian Fleming crying U.N.C.L.E. and opting to end his participation in the television series that would become The Man From U.N.C.L.E. But would have happened if he had stuck around? It might have been similar to Checkmate, a 1960-62 crime drama on CBS. 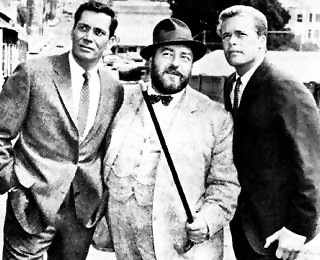 Checkmate featured two dashing private detectives (Anthony George and Doug McClure), aided by an academic (Sebastian Cabot). Two things stood out about the show: it was produced by a production company owned by Jack Benny and it was billed as having been created by novelist Eric Ambler (1909-1998), a contemporary of Ian Fleming. In fact, in the novel From Russia, With Love, Fleming’s James Bond has an Ambler novel with him on his journey to Istanbul. Amber in 1958 also married Joan Harrison, an associate of Alfred Hitchcock, who oversaw production of the director’s television series Alfred Hitchcock Presents. Ambler’s participation (or lack of it) in Checkmate mirrors what was shaping up with the television project originally named Solo: it was originally to have billed Ian Fleming’s Solo, but the heavy lifting of devising a pilot episode story was done by writer Sam Rolfe. Once Fleming signed away his U.N.C.L.E. rights for 1 British pound, Rolfe still only got a “developed by” credit instead of a “created by” credit for the 1964-68 series. Based on a sampling of episodes, Checkmate is entertaining. One episode (The Human Touch) featured Peter Lorre as the villain. Also, the series, including its theme music, was an early credit for composer John Williams (who called himself Johnny Williams at the time). Still, Ambler didn’t do the heavy lifting in terms of coming up with stories. That was left to others. As a result, we suspect had The Man From U.N.C.L.E. come out as Ian Fleming’s Solo, the author would have been a kind of front man (even if he had lived past August 1964) while executive producer Norman Felton, Rolfe (who produced the show’s first season) and others done most of the work of devising story lines.